The reward at the end of Silence is enough to justify the long, arduous journey. It’s always nice to see Martin Scorsese step away from the East Coast for a change of pace. This time, he puts aside foul-mouthed, gun-toting mobsters and other miscreants in exchange for Christian missionaries and Buddhists. But there’s still room for violence, even in 17th-century Japan. The story revolves around two Christian missionaries who set off for Japan in search of their missing mentor. It’s the 1630s and Christians aren’t welcome in the Land of the Rising Sun. In fact, they’re persecuted. Bringing the 1966 novel by Shusako Endo (a Japanese convert) to the big screen has been a 28-year passion project for Scorsese, who also directed Kundun (1997) and the highly controversial The Last Temptation of Christ (1988). It’s a passion play for Scorsese, an appropriate term which also has special significance in the Christian context. And it can also be described as an indulgence; that’s another term with significance in Catholicism. So Silence is an indulgent passion play that channels Scorsese’s ruminations on faith and the human condition. It’s most certainly not a vanity project; it’s full of earnest intentions and an honest yearning to find some sort of redemption. But, clocking in at roughly 160 minutes, it spends a lot of time rustling through the rugged terrain of coastal Japan (by way of Taiwan) in search of drama and compelling characters. Here, Scorsese is playing with different faces and a different color palette while mining a deeply personal, inner journey of the mind and soul. It’s the kind of subject matter that’s not easily filmed. 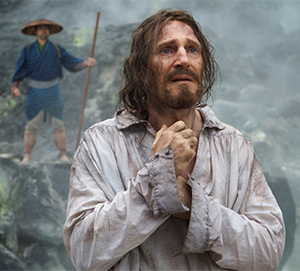 The titular “silence” refers to God’s apparent silence amidst the suffering of Christian missionaries and Japanese converts. And it’s also the silence the persecutors seek: quieting the fervor of the missionaries by seeking their renunciation in order to save the lives of those they had converted. As the two missionaries — Rodrigues (Andrew Garfield, Hacksaw Ridge) and Garupe (Adam Driver, Star Wars: The Force Awakens) — search for their mentor, Ferreira (Liam Neeson, Star Wars: The Phantom Menace), they witness firsthand the brutal persecution of countryside converts. The horrors include fresh hot springs searing human flesh and converts crucified on bamboo crosses, placed on the shoreline until the tides rise to drown out their voices. It’s rumored Ferreira has recanted and is now living in Japan, studying Buddhism. With a Japanese wife. And children. But how can that be? How can the one who brought them to the faith have walked away? Or is it all propaganda intended to undermine God’s work? This isn’t a movie that generates much in terms of excitement. There are moments of stunning cinematic flourishes, thoroughly expected from a film master like Scorsese. But this is a story of the internal journey. It’s about the human complications that ultimately undermine religion — the outward appearances people place as a priority over what is truly an inner experience. Stepping on an image of Christ as a symbolic gesture of renouncing one’s faith is all the Buddhists ask of the missionaries and the converts. It’s merely a formality, they say. It’s symbolism. It’s a physical square forced into a spiritual round hole. What is the true spiritual price for that physical act? Is saving human lives to live — and pray — another day an appropriate ransom to be paid for that action? As Rodrigues in particular endures a series of hardships and witnesses terrible acts, his isolation leads him to the verge of madness. It becomes a challenge to in itself to determine if the religion driving him is a force of good or is it a force lacking pragmatic reason? Therein lie the juiciest portions of Silence. It’s a battle of belief systems set in the 1600s, but relevant in the 2000s. As it’s pointed out in the thick of the violence, one religion’s selfish desire to convert another ignores the value they both offer. There’s plenty of room to share, rather than to dominate. While it’s a hard movie to get excited about, Silence is also a hard movie to dismiss.